Born in Glasgow 30th October 1962, Evans joined Bolton Wanderers as a Junior but did not make it past that stage and returned to Scotland in 1979 and joined Clyde. He scored four goals in thirty-six appearances before leaving for Albion Rovers two years later. He remained at Cliftonhill for three years and his twenty-eight goals in seventy-six games made him a firm favourite with the fans of the Wee Rovers. His next move was a year later when he joined Ayr United. He scored four goals in thirty appearances before next joining Hamilton Academical where he failed to score in two games. He quickly move to his final club where he remained until 1986 and scored six times in twenty-four appearances, before his career was ended by a knee injury at the age of twenty-four. It was not until eight years later that he took up his first managerial appointment. It was with lowly Stamford, who were then operating in the ninth rung of the Football League, but four years later he had helped them to gain promotion from the United Counties Football League Premier Division to the Southern Football League, which saw him leave the club to join Boston United in October 1994. He led Boston from the Southern League, in 2000, and into the Football Conference and then, in 2002, he piloted them into League Two of the Football League in 2002. "Contract irregularities, led to Evans being suspended by the club in July 2002. Evans resigned as Manager in September 2002 and was found guilty by the F.A. in December 2002 and received a twenty month suspension. He returned to manage Boston after that suspension had been served. In 2007, he was also given a one year suspended sentence and fined £1,000 for tax evasion. But on the football pitch Boston were in dire straits, with an understrength team they slipped quickly down the table and needed victory over fellow relegation contenders, Wrexham, on 5th May 2007. They led 1-0 at half time but conceded a penalty which saw Wrexham draw level. Two further goals in the final minutes saw their fate sealed. Initially Evans pledged to stay but on 27th May 2007 he resigned. Two days later he was appointed Manager of Crawley Town. Despite disciplinary problems, which resulted in touchline bans Evans took the club to success and thanks to substantial financial backing of the club they were able to gain promotion to the Football League Two in 2011 and had a good run in the F.A. Cup, which saw them reach the fifth round before losing 0-1 to Manchester United. Crawley enjoyed unprecedented success and seemed certainties for promotion to League One, when Evans left them to join fellow promotion contenders Rotherham United in April 2012. Crawley gained promotion but Rotherham missed out, but the following season the Millers gained promoton to League One and followed that by promotion to the Championship and the end of the following season in May 2014. He signed a three year contract renewal but after keeping them in the Championship in the 2014-15 season, he resigned in September 2015 and Neil Redfearn took over on 9th October 2015. On 19th October 2015, Evans was appointed Manager of Leeds United. This seemed peculiar as Evans views were well known, having been quoted in October 2014 as saying he could never work for an owner who interfered in squad selection and transfers like Leeds owner Massimo Cellino, but just a year later he saw no problems with Cellino other than "the day the owner picks the team is the day I leave the club" when he and his assistant, Paul Rayner, joined the club on a rolling contract until the end of the season. 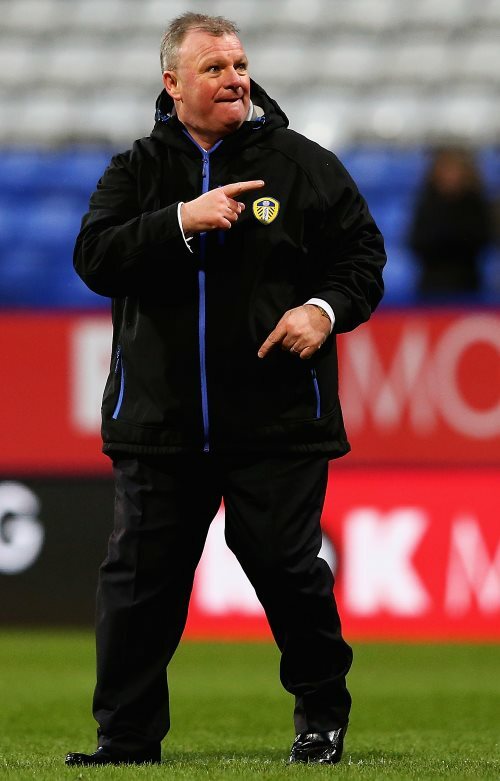 When he took over Leeds were eighteenth and just three points clear of the drop zone. At season's end they finished thirteenth, fourteen point clear of relegation. Evans future at Leeds was uncertain, as several Managers were offered the position, as valuable time was lost in preparing for the 2016-17 season, as the chaos of the Cellino regime continued. Evans had achieved the goals set for him by steering Leeds clear of relegation and in the thirty-eight games he was in charge, amassing fifty-four points as Leeds finished thirteenth in the final standings. It was announced by the club on 1st June 2016 that Evans had been dismissed. His record was played thirty-eight, won fourteen, drawn twelve, lost twelve. The following day Garry Monk was appointed Chief Coach at Elland Road on a one year rolling contract. Evans was then linked with Bradford City, but pursued a larger financial package with a China League One side, but then put family before self and decided to remain in England. On 21st June 2016 he was offered the position of Manager at Oldham Athletic but after agreeing terms he decided there were more lucrative offers in the pipeline. He was appointed Manager of League Two side Mansfield Town on 16th November 2016, and guided them to twelfth place in his first season. There he won thirty-five, drew twenty-two and lost nineteen of the seventy-six games of his tenure, before resigning on 27th February 2018 as the club stood fifth in the League just two points behind the third team. He was appointed Manager of Peterborough United the following day. In his first eighteen games at London Road, he had won nine, drawn two and lost seven games.